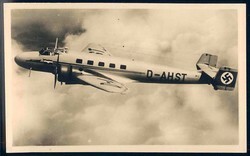 JUNKERS G38. 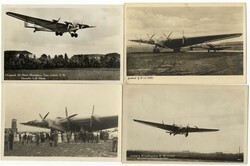 4 different picture postcards. some minor faults. 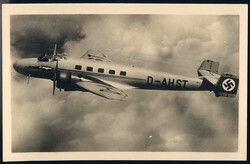 "Junkers-Ganzmetall-Großflugzeug G 24" picture postcard no. 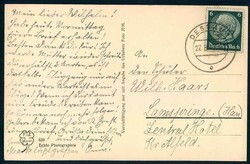 9147, published by Klinke & Co. Berlin, real used. Corner crease. 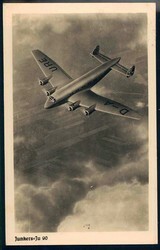 "Junkers-Ju 90" picture postcard no. 236, published by JFM/Dessau, real used. Corner crease. 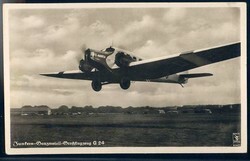 "Junkers - Ju 86 Schnellverkehrsflugzeug" picture postcard no. 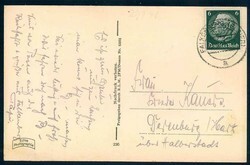 639, published by FZ Dessau, real used. 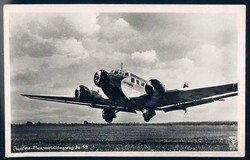 "Junkers-Ju 86" picture postcard no. 301, published by JFM/Dessau, unused. 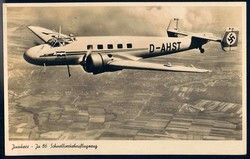 "Junkers-Ganzmetallflugzeug Ju 52" picture postcard no. 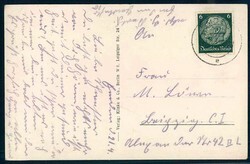 Fl 7, published by Klinke & Co. Berlin, unused.